Everton return to FA Cup action tonight looking to progress through a tricky replay against Oldham Athletic to secure a place in the Quarter Finals. The FA Cup will come as a welcome relief for the Everton squad, who are currently in the midst of a difficult month of Premier League action. Two consecutive away defeats have left the Blues Champions League hopes in tatters, but the season still has plenty left to offer. Starting tonight, David Moyes’ men must first ensure safe passage past their League One opponents. Wigan Athletic await in the next round, and with that tie scheduled for Goodison Park, the Blues have an excellent opportunity to secure a return to Wembley for the 3rd time in 5 seasons. David Moyes will name a strong team tonight. Seamus Coleman has come through the weekend unscathed and will provide Everton with a real threat from right back. We expect Kevin Mirallas to return to the starting XI, but it is difficult to second guess Moyes at the moment, who preferred the disappointing Scot, Steven Naismith to the Belgium international in the last match at Norwich. A return to fitness for Victor Anichebe would be most welcome, although this fixture is likely to come too soon for the big Nigerian. Our archive footage today comes from a 5th Round tie played in 1991. This famous tie against our Merseyside rivals required two replays. The first game had ended in a entertaining, but disappointing 0-0 draw at Anfield and no one was expected what was to come in the replay at Goodison Park. 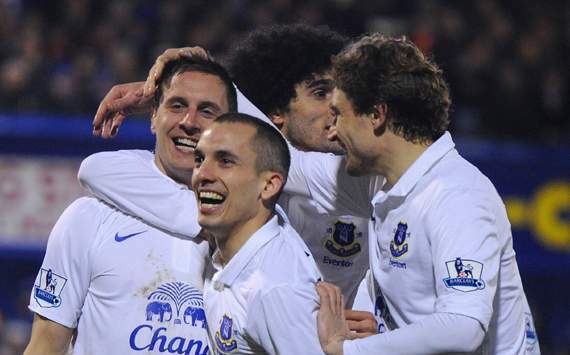 8 goals and a week later, the teams were back at Goodison for the second replay. This time a solitary Dave Watson goal proved the difference between the teams, with Everton progressing to the quarter finals.